ROCHESTER, NY (WXXI) – New York Senator Kirstin Gillibrand is taking on pharmaceutical companies, in an effort to keep prescription costs low. She made a stop in Canandaigua Monday morning to talk about price gouging on many brand name medicines. 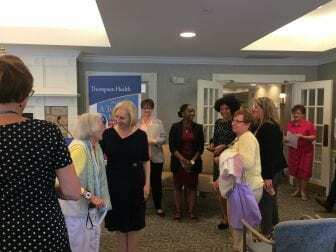 Gillbrand spoke at the Ferris Hills senior living community, saying she hears complaints about drug costs all the time from constituents, and while it’s a problem with really anyone who needs a prescription, it’s an urgent issue for many seniors, many of whom lived on a fixed income. She says she’s working on a number of bills to battle this crisis. Chris Dailey is the Director of Pharmacy at Thompson Health. He shared examples of increases he’s seen and the battle to get people affordable medications. Dailey shared a few examples of increases he’s seen on his end of the prescribing process. Dailey says adjusting patent laws and making more medications open to genetic companies would also help with pricing as well. A number of stories were shared about people choosing if or when to buy necessary prescriptions based on cost and Gillibrand urged people to continue sharing their journeys; she says the bill is not yet bipartisan.